In celebration of Independence Day, we are offering a special on our Website. We are offering a USA cross necklace for $4. This is a great way to show how much you love to be an American. 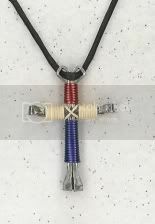 Get your Red, White, and Blue Cross necklace today. To get this special price go to http://www.heavenlycrosses.com/customizecross.htm and fill out the Customize your Cross order form. Make sure you put July special in the Promotion Code box. Hurry offer ends July 31, 2006. All of our Cross necklaces, zipper pulls, and key chains are $8 each and this includes shipping, in the US. For an additional fee we can send to Canada as well. Are you looking for ways to raise money for events you want to do in the fall? Let Heavenly Crosses help you get that money, the easy way. Our cross necklaces are easy to sell. Everyone loves these because they show there love for God and they make perfect gifts for anyone. Ask us how we can help you today! Please feel free to send this newsletter to others and have them join our list. We have a special promotion going on this month. We will be giving a way 2 crosses. This is how it will work. Refer as many people as you can to join our newsletter list. Each person you refer will have there name put in the hat for a free cross. Also, your name will go in to a drawing for a free cross as well. All you have to do is send us an e-mail at heavenlycrosses@msn.com and let us know the name of the person that you referred. When they join we will put your name in the hat. You can have your name entered as many times as you want. To sign up for our newsletter go to http://www.heavenlycrosses.com and fill out the newsletter form at the bottom of the page.